Transmitting a distress alert either through the polar orbiting satellite service, operating in the 406 MHz band, or through the INMARSAT geostationary satellite service operating in the 1.6 GHz band. The Unit will also float free if the ship sinks and will be automatically activated when afloat or activated manually in emergency. The EPIRB mentioned here is operated on 406 MHz and 121.5 MHz by the COSPAS/SARSAT satellite system which is adopted widely to the ships in the early stage of the introduction of GMDSS. 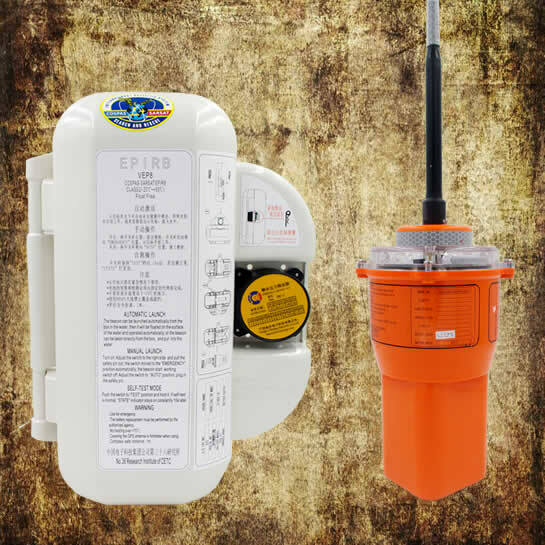 This type of EPIRB will broadcast on 406 MHz to be received by the COSPAS/SARSAT statellite and on 121.5 MHz to be used for homing by search-and-rescue vessels along with a strobe to pinpoint exact location. It is required, when ordering, to specify the ship’s registered flag, call sign, etc. to be programmed into EPIRB as a rescue signal by the manufacturer before delivery. 2. A.810(19) Performance Standards for Float-free Satellite Emergency Position Indicating Radio Beacons(EPIRBS) Operating on 406 MHz. 3. A.696(17) Type Approval of Satellite Emergency Position Indicating Radio Beacons(EPIRBS) Operating in the COSPAS-SARSAT System. 4. IEC 60945 2002 Maritime Navigation and Radio Communication Equipment and Systems-General Requirements-Methods of Testing and Required Test Result.